The Junkers J 2 was the first all-metal aircraft intended as a dedicated military aircraft design, the first all-metal aircraft meant to be a fighter aircraft, and was the direct descendant of the pioneering J 1 all-metal aircraft technology demonstrator design of 1915.
a climb rate to 3,000 m (9,840 ft) altitude within 20 minutes. The IdFlieg contract for the ordered aircraft also specified that "the greatest maneuverability and nimbleness in flight must be achieved by the aircraft", a possible concern by the German governmental agency, over the usage of the heavy electrical steel sheet metal that made up the earlier J 1's structure. Herr Junkers began wind tunnel and design work promptly upon receipt of the contract paperwork, and eventually, by the end of the spring of 1916, an aircraft emerged from Junkers' Dessau workshops that was much more streamlined in appearance than the J 1 had been. The J 2 airframe that emerged from the Dessau workshops had an evolved appearance from the J 1, as the fuselage nose now almost completely enclosed the Mercedes D.II engine, except for the open top of the cowling. The J 2's fuselage structure had rounded dorsal and ventral contours, instead of the boxlike right angles of the J 1, possessed a narrower and deeper ventral "belly" radiator enclosure, and used a horizontal stabilizer planform shape that would become familiar on later, all-duralumin Junkers monoplane designs to be built during 1917-18. The "all-moving" rudder still possessed no fixed fin, like the J 1. A faired-in headrest was provided for, as well as a "roll bar" placed above the headrest for additional pilot protection in case of the aircraft flipping on its back during a crash landing. The J 2's landing gear was of the usual vee-type, but a bit taller than the J 1's had been, with the upper ends of the legs anchoring not onto the fuselage "corners" as on the J 1, but on the first wing rib "bay" beyond the wing root, with a long tailskid that emerged from the lower rear fuselage directly below the stabilizer's leading edge root location. The wings had at least three different airfoil changes running from root-to-tip, and had sections of them electrically roll-welded for stronger, more continuous bonding for greater strength. The resulting aircraft was intended to be smaller than the J 1 demonstrator, but with its steel structure, it almost equalled the J 1's completed weight. One feature pioneered in the J 2, that would also be used in later all-metal monoplanes designed and built by Junkers in World War I, was a "unitized" forward fuselage structural concept, combining the framing of the engine mount, wing roots and cockpit framing into one central integral structure. 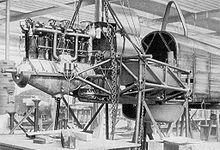 The first production example of the J.2, with IdFlieg serial number E.250/16, was delivered to Adlershof (near Berlin, the home of Germany's first airfield) on 2 July 1916, and started its IdFlieg-mandated static load testing. Otto Mader, one of the J 2's designers, then promised the IdFlieg agency that the following example, serialled E.251/16, would have even greater structural strength than the E.250's airframe possessed. Leutnant Theodor Mallinckrodt, the pilot that had first "hopped" the earlier J 1 some seven months previously, took the E.251/16 example up for the J 2 design's maiden flight on 11 July 1916. Mallinckrodt gave the E.251 example that he flew a good overall evaluation, judging it as "very maneuverable", with good turning qualities and safe aerodynamic behavior. A short time later, IdFlieg test pilots Unteroffiziers Wendeler, and Max Schade, began "wringing out" the six examples of the J 2 as they arrived at Adlershof for their full range of flight evaluation tests. Unteroffizier Schade would eventually take one of the test aircraft on a flight from Berlin (most likely from the government's Adlershof/Johannisthal facility) to Dessau later in the summer of 1916, achieving the then-high speed of 180 km/h (112 mph) with the aircraft, which was some 16 km/h (10 mph) faster than the contemporary French Nieuport 11, but as the J 2 test aircraft still seemed to come up short in climbing performance tests, when evaluated against wood structure designs, like the then brand-new, Robert Thelen-designed Albatros D.I aircraft, the steel structure of the J 2 made it just too heavy to be able to compete in air combat over the Front. At least one example (E.253/16) of the J 2 was fitted with slightly longer wings and matching longer ailerons, possibly in an effort to decrease the wing loading of the initial J 2 design, and another tested "upgrade" to the J 2s under test was to fit at least one of the aircraft with the then-new 119 kW (160 hp) Mercedes D.III engine, and one of the J 2s so equipped achieved an amazing-for-the-time 200 km/h (124 mph) at full throttle in testing. Shortcomings of an "iron aircraft"
...This could not be achieved with iron, and we had to choose a new material...light-weight metal. But not only the choice of iron had resulted in high weight. We had built too heavy because we wanted a safe aircraft and partially because we had not extracted the optimum structural strength from the material". Unteroffizier Schade, after making the record Berlin-Dessau flight, would later lose his life in a crash, from entering a spin on 23 September 1916 in one of the J 2s, and this event, combined with the substandard climbing performance of the J 2 series of test aircraft, caused IdFlieg to withdraw any further governmental support (effectively ending the J 2's contract) for the Junkers firm's advanced monoplane designs until a lighter metal, such as duralumin, was selected for such designs. The first attempt to use duralumin for airframe construction by the Junkers firm was the never-completed J 3 mid-wing, rotary engine-powered, aluminum tubing fuselage single-seat monoplane design, of which only the corrugated sheet duralumin-covered wing structures and "bare" tubular fuselage framing, primarily as an engineering exercise, were finished shortly before the end of 1916. It is also thought that the contrasting promise of the advanced, low drag features of the Junkers monoplane aircraft designs, versus the Junkers firm's usage of experimental non-traditional sheet metal materials, and the firm's habit of almost constant experimentation obstructing any future hope of producing its advanced designs for the Luftstreitkrx�fte, compelled IdFlieg to create the Junkers-Fokker Aktiengesellschaft, abbreviated as Jfa and pronounced as if spelled "iefa" in German, on 20 October 1917, to allow Anthony Fokker, who even flew one of the J 2 aircraft in tests late in December 1916, to improve the future producibility of the advanced designs of the Junkers firm.